The vacuum chambers, or beam pipes, of the LHC experiments are located right at the interface between the detectors and the accelerator, and are therefore crucial to the LHC project as a whole. In this domain, the ALICE and CMS experiments have just passed an important milestone, with the completion of the first of CMS's two end-cap vacuum chambers, together with the completion and bakeout of an 18-metre section of the ALICE vacuum chamber. These complex projects, for which CERN's AT/VAC Group is responsible, involved dozens of people over a number of years. One of the two end-cap vacuum chambers for the CMS experiment has been completed. This 7.5-metre-long cone-shaped object is the fruit of many years' development and its machining and assembly were performed with the utmost precision. 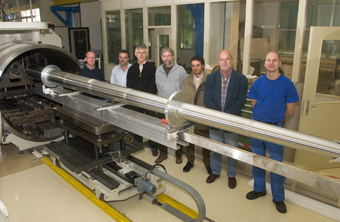 Part of the team involved in the design and production of the end-cap vacuum chamber for CMS, standing behind the completed segment. From left to right : Thierry Tardy (TS/MME), Luigi Leggiero (TS/MME), Patrick Lepeule (AT/VAC), Gérard Faber (ETH Zürich), Stefano Bongiovani (CINEL Project Manager), Giuseppe Foffano (TS/MME) and Marc Thiebert (TS/MME). The CMS vacuum chamber is taking shape in Building 112. One of the end-cap vacuum chambers, a 7.5-m conical segment, was completed at the end of last year. This segment, which constitutes the largest vacuum chamber component of all the LHC experiments, is the fruit of a partnership between CERN, Kraków University of Technology in Poland and the Italian firm CINEL. "It has been 15 years since we first started discussing this vacuum chamber," explains Patrick Lepeule, the project engineer in the AT/VAC Group. The vacuum chamber, or beam pipe, which runs deep through the heart of the LHC detectors, is the interface between the accelerator and the experiments, and must therefore meet the sometimes contradictory requirements of both experimental physicists and their accelerator counterparts. Experimental physicists require the straightest and most transparent chamber possible so that every single particle produced in the collisions is visible to their detectors. On the other hand, accelerator physicists want a strong, reliable beam pipe with no leaks and maximum electrical conductivity. Finally, an extremely high vacuum must be maintained inside the chamber to avoid parasitic particles from interacting with the beam. The whole task is rendered more complex still by the sheer size of the LHC experiments. "The vacuum chamber running through the CMS detector is 42 metres long," states Patrick Lepeule, "Eight times longer than any of the vacuum chambers for the LEP detectors." The ideal metal for the beam pipe inside a particle detector is beryllium, which is 20 times more transparent to particles than steel, 50% more rigid and only 25% as dense as steel (see Bulletin No. 5/2005). However, beryllium is notoriously difficult to machine, must be handled with care and is very expensive. It is therefore used for only a small, 6-metre section of the CMS beam pipe. The end-cap segments of the CMS vacuum chamber, on either side of the beryllium central segment, are made of a special stainless steel material, optimised to obtain very low magnetic susceptibility and thus cause minimum perturbation to the experiment's magnetic field. At the collision point, the vacuum chamber is just 58 mm in diameter, increasing to 310 mm at each extremity. This conical design is aimed at the detection of very forward particles, which is the specific purpose of the CASTOR and TOTEM experiments that will be integrated into the CMS detector. The pipe wall must also be as thin as possible to allow the particles produced to pass through. Its thickness increases with the diameter of the pipe, from just 1.3 mm to 2.8 mm. Finally, the pipe must be perfectly straight, with an alignment precision of less than 0.3 mm over its entire 7.5-metre length! The vacuum chamber was designed and developed using the finite-elements simulation technique in collaboration with Kraków University of Technology. The ten segments that make up each end-cap vacuum chamber were produced by the Italian firm CINEL, which specialises in precision machining. To ensure the perfect homogeneity of the material, the segments were machined directly from raw stainless-steel cylinders weighing 4 tonnes in total. 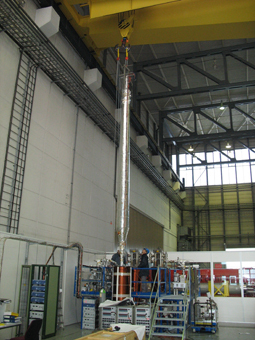 The segments were then assembled at CERN using the electron-beam welding technique under vacuum, a speciality of the TS/MME Group. The components also received an inner copper coating. They have still to undergo air-tightness tests and bakeout in Building 927, before receiving a Non Evaporable Getter (NEG) coating, which ensures a high level of vacuum under operating conditions. The second end-cap vacuum chamber for CMS has now also been fully assembled, and assembly of the beryllium central segment is underway in the United States. A full assembly and bakeout have just been successfully completed on the conical ALICE Absorber beam vacuum chambers. A bakeout is a procedure in which the vacuum chambers are heated from the outside in order to improve the vacuum. This procedure is done periodically to achieve and maintain the low pressure needed for ALICE and the LHC operation. 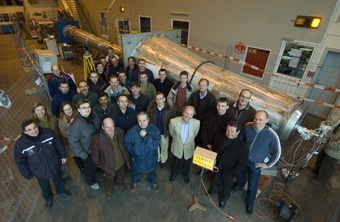 A good example of cooperation: Several of the 70 people involved in the project pose in front of the ALICE Absorber containing the beam pipe. Six CERN departments and six sub-contracting companies have participated in the design, production and testing of this vacuum chamber. Vacuum bakeout will be one of the hot topics for CERN vacuum technicians over the next 18 months. Most of the 6 km of the room temperature parts of the LHC vacuum system will be coated on the inside with a Non-Evaporable-Getter or NEG pump. When heated to about 250 Â°C, this NEG becomes activated and starts to trap gas onto the chamber walls, so improving the vacuum. This is particularly important where the LHC beams pass through the experiments, as any residual gas in the chamber gives rise to background for the sensitive particle detectors. At the end of this ALICE test run, a static vacuum of better than 10-9 Pa was achieved. To get there was a long and stony path. More than 70 people at CERN have been involved from conception to final testing of this 18-m-long, conical vacuum section (formed from several pieces). Once a concept had been agreed upon that fulfilled the requirements of both the experiment and the machine vacuum, detailed designs were needed for the beam pipes, supports, installation tooling and handling equipment. Before manufacturing could start, the appropriate stainless steel grade compatible with the magnetic and vacuum requirements had to be procured. Manufacturing of the conical vacuum chambers proved difficult: meeting mechanical tolerances and producing ultra-high vacuum-tight welds proved a challenge even for an experienced company. Severe acceptance tests assured that no problems would arise during subsequent assembly steps. An internal copper plating of the beam pipes is required to reduce the electrical impedance seen by the beam. A special procedure was developed for electro-plating these conical tubes at CERN, which were then heated to 300 Â°C to ensure the copper layer was perfect. The gases leaving the surface during this test were analysed to look for hidden pockets between the copper layer and stainless steel chamber. To gain space for the ALICE experiment, a thin foil heater, specially developed at CERN, was mounted on the vacuum chamber along with high-performance ceramic powder thermal insulation to reduce the heat lost into the experiment during a bakeout. The last manufacturing step was the deposition of the NEG inside the tubes. This was performed in an 8-m-long solenoid magnet, built at CERN for the coating of LHC vacuum chambers. The installation and assembly of the beam pipes into the 90-tonne ALICE Absorber was a challenging task for transport and handling. The fragile but heavy conical vacuum pipes had to be integrated into the Absorber with only a few millimetres of clearance. CERN surveyors were on hand to ensure that the beam pipes were well aligned. The final surface test in the ALICE building, SX2, was a success. Both mechanical and bakeout systems performed as foreseen, with a final pressure of below 10-9 Pa, which is good news for both machine and experimental physicists. In conclusion, it takes many people and a good team spirit to create "nothing," i.e. the excellent vacuum required for the LHC beams and ALICE physics. In the coming weeks, the whole section will be dismantled and lowered to its final destination: the ALICE cavern. One of the ALICE Absorber beam pipes ready for lowering into the solenoid magnet for NEG coating.